Where can you go to get a good pour in the Russian capital? Check out our guide. Most of the wines are French, but Italian bottlings are also very present – the Pinot Grigio Elena Walch 2011 is available for $45 and a Jaquesson Cuvee Brut for $143. 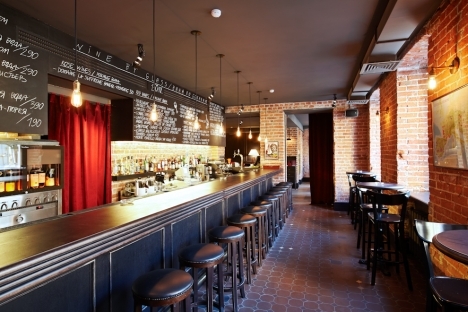 Gavroche is quite a new place on the Moscow map, but well worth visiting. Grand Cru is also quite famous for its connection with Spanish chef Adrian Quetglas who controls the menu. The prices are not particularly cheap, but people come here for the high level of service and guaranteed wine satisfaction no matter what their taste buds are up for. The owners themselves are regulars in the bar, which is another sign of their commitment to the place and their products. In order to handle its low-priced range of wines (starting from as low as $13 per bottle!) the bar had initially to remove “wine by the glass” option from its menu – but this option is now available again. Although the bar is not so easy to find, it’s full of people almost every night. The interior is very cozy and home-like, which is something that is missed in places like Gavroche. The background music is another advantage – good taste can be heard from far away. The restaurant is on the 5th floor of the Nautilus business center on Lubyanka Square right in the middle of the city. The wine list is really nice and the concept of selling wines dominates the whole idea of the place. After 6pm, almost each wine has two different prices here – one if you want to drink the wine at your table (more expensive), and the other – if you want to leave the bar in the evening with a bottle that you liked most. Before the evening, the take away price is the same as the price in the bar. By the way, did I mention great Florentine steaks and the possibility to come with your own bottle?